Northern Tablelands MP Adam Marshall, left, with Inverell District Family Services’ Northern Roads Activity educators Kylie Hill, Debbie Wilson, Michelle Campbell and Jodi Uebergang. 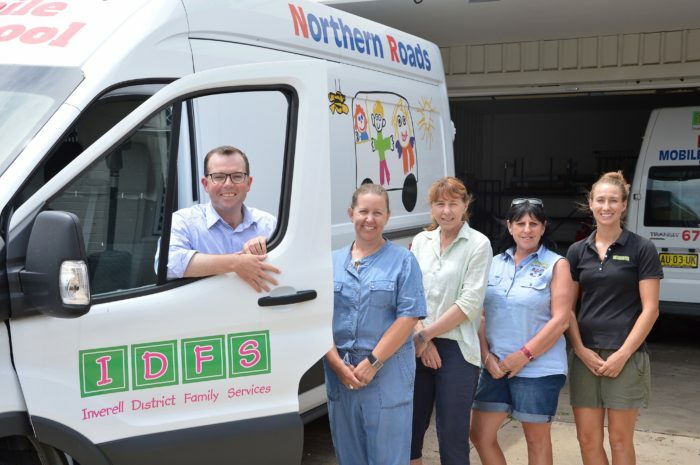 INVERELL District Family Services’ (IDFS) Northern Roads Activity Vans (NRAV) will soon be seeing some major improvements with $60,591 in State Government funding announced today by Member for Northern Tablelands Adam Marshall. The two vans operate an outreach preschool and activity service to the smaller communities of Gum Flat, Bukkulla, Wallangra, Delungra and Gilgai. Mr Marshall said the funding would see the older of the two activity vans replaced with a new model, while the remainder of the funds would be used to upgrade the facilities used by the educators and youngsters at Delungra and Gilgai. “This funding is wonderful support for the fantastic work that the Northern Roads Activity Vans and educators do in some of our smaller communities,” Mr Marshall said. “It’s a great step forward to ensuring that children in Gum Flat, Bukkulla, Wallangra, Delungra and Gilgai get the best possible opportunities in their formative years. “The new van will enable IDFS to replace the existing NRAV 1 which is over 10 years old and has racked more than 180,000 kilometres. Delungra’s NRAV 2 centre will see the benefits of new shade structures replacing the existing structure at the Country Women’s Association Hall. The Gilgai and Delungra centres will benefit from a water and sand table that will complement their education in water play. The Northern Roads Activity Vans have been operating since 1978, celebrating their 40th anniversary last year.